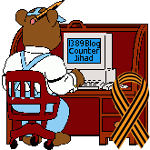 #Caturday, June 25, 2016: Her cats wanted outdoor time but it wasn’t safe… — 1389 Blog - Counterjihad! Check out this genius solution! It’s a dangerous world out there, and generally speaking cats are best kept indoors for their own safety. Still, most of us with indoor-only kitties have seen them staring longingly out the windows. One dedicated cat-mom came up with this utterly brilliant solution–a way to keep her kitties safe from bears and speeding cars while still allowing them to enjoy all the sights and sounds of nature. Check it out below. We guarantee you’ll be as impressed as we were! The cats getting ready for breakfast. Previous post: Does prayer really work?